First of all, not all Growth Factors are created equal. Some have amazing science behind them, (I am talking Whoa! ), some are great for post-procedure and help your skin recover faster from treatments such as FotoFacial and Microneedling, some do their magic day and night. But the important thing here is that they all help your skin get to a healthier state. Growth Factors are proteins that play a vital role in maintaining healthy skin cell function, they communicate with your cells and stimulate them to repair themselves and produce more collagen and elastin. When the skin is damaged (like aging or sun damage for example), the Growth Factors send messages to the surrounding cells to repair the damage. As we get older they become sluggish and less effective but the right Growth Factor skin care product can provide a boost and help your skin rejuvenate itself more easily. 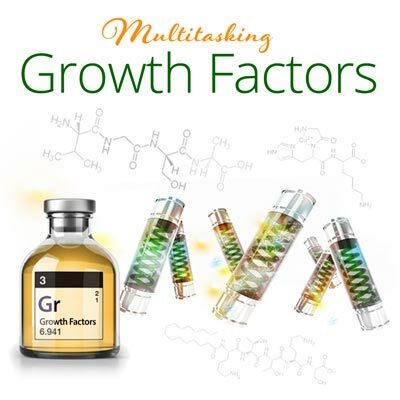 6 Reasons Why Growth Factors are Multitaskers! Growth Factors boost collagen and elastin production. This results in smoother, plumper, firmer and more youthful complexion. Growth Factors are found naturally in your body. They are responsible for tasks such as replicating cells, reducing inflammation, repair and recovery, stimulating collagen and elastin production. Growth Factors help reverse sun damage by promoting new cell growth, which replaces the cells injured by UV radiation. Growth Factors are considered one of the best active ingredients for skin rejuvenation and they work really well with other products such as Vitamin C, Retinol, and Hyaluronic Acid. They mix well with others! Growth Factors go straight to repair the skin’s “injury”, so they are perfect companions to fillers and skin treatments and often extend your results. Growth Factors’ regenerative properties have been proven to help skin tone, texture, elasticity, and firmness. They’ve also been shown to reduce hyperpigmentation, age spots, and the appearance of fine lines and wrinkles. 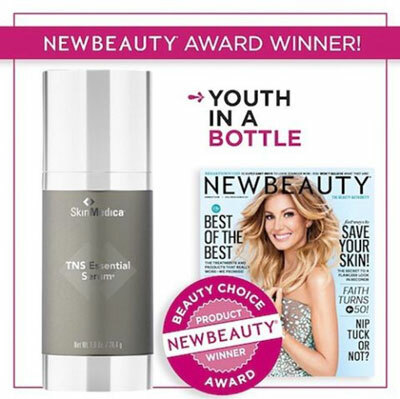 SkinMedica TNS Essential Serum received the 2017 NewBeauty award! Buy yours today and let your skincare multitask for a beautiful healthy skin! Are your lips aging as we speak? Comments Off on Are your lips aging as we speak?